The scent of lotus flowers is one of my favorite floral aromas, but smelling lotus in bloom is a rare treat. Lotuses blossom three hours "down the road" in Portland, Oregon, but it doesn't stay warm enough, long enough for them to flower here in Seattle. If you want to know what lotus smells like, find a lotus pond and sniff the newly opened blossoms; do NOT rely on perfumes that mention 'lotus' in their ingredients or you will be a Lotus Ignoramus. Guerlain Mitsouko Fleur de Lotus and Pacifica Lotus Garden proclaim their devotion to LOTUS. Both fragrances fail to capture the scent of real lotus blossoms, but there's more to talk about than lotus in these perfumes, right? 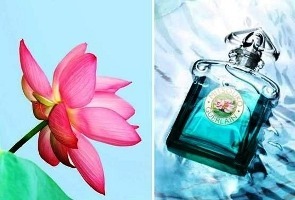 Mitsouko Fleur de Lotus (shown above right) was supposedly formulated for Asian perfume consumers: a group that likes their fragrances on the light-breezy side. Mitsouko Fleur de Lotus goes on very sweet with an indistinct floral note mixed with citrus and the fleeting aromas of jasmine and peach. In its early stages, Mitsouko Fleur de Lotus resembles classic Mitsouko in Eau de Toilette strength — but with added sugar and without classic Mitsouko's jab of moss. As classic Mitsouko takes a shady wooded path to its peppery-peachy finale, Mitsouko Fleur de Lotus launches into the stratosphere and becomes bright and rain-soaked. Applied with restraint, Mitsouko Fleur de Lotus disappears on my skin within an hour; it smells (almost) like a "sweet-flowers-and-spice" sport fragrance for young women — something to absent-mindedly spray on after a shower. (And speaking of 'clean and fresh', Mitsouko Fleur de Lotus' extreme dry-down smells like another classic 'fragrance': original WOOLITE®.) If you apply Mitsouko Fleur de Lotus lavishly, the scent will last a long while, but it will be insufferably sugary-sweet. To my nose, this is a feminine perfume. Wisely, Guerlain has used the Mitsouko name and bottle, and the lotus association (lotuses are a potent Buddhist and Hindu symbol throughout Asia) to appeal to prospective buyers. I'll admit I almost bought this perfume without smelling it because of the name (I wear classic Mitsouko), the blue bottle and lotus; a sample arriving in the mail saved me from a bought-unsniffed disaster. Lotus Garden was inspired by Pacifica founder Brook Harvey-Taylor's love of two lotus gardens — one near Santa Barbara, California, and the other at Angkor Wat, Cambodia. Pacifica ad copy reads: Though worlds apart, both gardens are places for contemplation, refuge and pure beauty. Perfumed with green notes, citrus, lotus and olibanum; every ingredient is carefully layered together so that each inhale takes you deeper into bliss. The lotus, said to always be looking for its place in the sun, is a symbol of strength, unyielding passion, spiritual enlightenment and unconditional love. This fragrance is dedicated to all who seek such beauty in life. Lotus Garden should be called "Green Mango Garden"; it smells a lot like (a less complex) Hermès Un Jardin Sur Le Nil. Apart from green mango, I smell citrus (grapefruit? ), an aquatic note, soft musk, and, every now and then, a spicy note that reminds me of tomato leaf. This is a nice fragrance, especially at the price, and I'd rather wear it than Mitsouko Fleur de Lotus. I'll continue to hope that some genius perfumer or fragrance company will produce a perfume or note that conjures the scent of authentic, lush lotus blossoms. Until then, enjoy real lotuses whenever you have the chance. Guerlain Mitsouko Fleur de Lotus is available at the Guerlain boutique at Bergdorf Goodman, New York; 60 ml Eau de Toilette, $100. 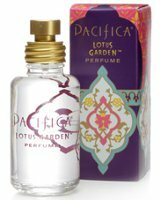 Pacifica Lotus Garden perfume is $22 for 1.2 oz. For buying information, see the listing for Pacifica under Perfume Houses. Top left image is Pink Lotus by Tanakawho at flickr; some rights reserved. Kevin: interesting clear-eyed assessment of the rebirthed Mitsouko’s calculated appeal to Asian consumers, between the scent tweaking and the lotus symbol deployment. And, boy…you didn’t like that one, didja? I’m not a huge fan of the original Grande Dame but at least it’s interesting! I’ve tried a little Pacifica but their stuff is good. Another great post, thanks! Suzanne: thanks…the Pacifica perfumes are consistently nice, aren’t they? I first smelled lotus at Lotusland, one of the two inspirations for the Pacifica. I have never smelled a perfume that captured the scent. Interesting that they mentioned Lotusland (http://www.lotusland.org/welcome.htm) in the Pacifica back story. I’m also glad to hear you’ve been there, Kevin. It’s a real must-see for garden lovers. I’ve never been there when the lotus are in bloom, nor have I smelled a blooming lotus. I’m adding it to my list of things to do. It’s too bad that “Mishima Lotus” isn’t terrific, but we weren’t expecting much, were we? I still have to have a sniff at some point. Pacifica sounds more up my alley, but I’ll probably stick to my beloved Sur le Nil for my mango fix, I think. Thanks for the review! Joe: Pacifica is even MORE mango-y than Nil…more “rounded” fruit note. I’m always surprised at the Pacificas. And you have no excuse not smelling lotus…bet you could find some in Santa Barbara or Montecito! K: I’ve been wanting to try AG Folavril since I learned about it just a couple months ago, since mango + tomato leaf sounds perfect to me. Have you tried it? Like it? Joe: I did wear it ages ago and liked it a lot…even when riff-raff said I smelled like bug spray. Hey Joe – I tested Folavril last summer, and should probably revisit it. I didn’t care for it – indeed it is like tomato – but at the time I was really interested in searching for more classic florals. I hesistate to say it smelled like household air freshner or bug spray, but I recall it smelled a lot like a *very* zesty cologne – a tomato leaf cologne. But hey, I love the smell of tomato vine I just never thought of wearing it. I didn’t really pick up on the mango for some reason – maybe because I just love that wonderful fragrant aroma of mangos and I just didn’t notice it with the tomato, etc. I would never say it was gourmand at all. In either case it would probably make an excellent and unusual masculine. I need to dig more into the Pacifica line – I like their scents, although all I have are a couple of solids (which I lament about in the Crazy Libellule post today). In fact, I really don’t know why I’ve been crying around about not having a good summer scent when all I need to do is pick up a bottle of the Malibu Lemon Blossom!! This one does sound interesting. There are some flowers that are difficult to capture. As much as plumeria (frangipani) is used, there are very very few that actually smell anything like a plumeria. I have a tiny bit of an essence I bought on Kauai that is the closest I have ever found. TAMA: did you ever try any Mālie Kaua’i products? Plumeria is difficult…but “do-able” it seems. I love that smell too. I think I’ve seen them around – I bookmarked them. One of my favorite plumeria things is The Island Soap Company’s Plumeria Lei Floral Water. It is just a spritzer, but you spray it around on yourself and for a little while you are transported. It is, also, not as rare as my little essence thing! Tama, is it the little pot of “lei” essence from Malie? That is very special, even though not long lasting. I don’t see it on their website any more! No, it is a little dram bottle of Kauai Flower Perfumes Plumeria. I got it a pretty long time ago, and the bottle has no other info. I need to use it before it goes bad. Tama and Kevin, as you probably know, Malie doesn’t really make personal perfumes. Their line is focused on aromatherapy, spa products, and home fragrance. I think they’re very good, and have splurged a few times on their lotions, soaps, and a reed diffuser (wow on the latter!). I agree that capturing plumeria really well in perfume seems tricky. The fragrance that does it best for me is Le’a by Saffron James. Its focus is two common-to-Hawai’i plumeria varieties. Tama, I’m sending you a sample and you can tell me what you think! Kevin the new Pacifica fragrance sounds yummy! Thanks for the review. Well I just happen to be obsessed with finding the perfect plumeria scent after having recently returned from Hawaii (where all the plumeria stuff in the touristy places was crap), so I’m going to have to continue off topic for a bit. So far I like Ava Luxe’s frangipani quite a lot and find Lucy B’s to be truly horrible. I’m curious whether others find the Ava Luxe frangipani to be true to the flower’s scent? I’ll have to try the Saffron James’ one — thanks for the rec, Haunani. Hi Sunski. The Saffron James Le’a is lovely; longevity could be better. Do try it! You have me interested in the Ava Luxe — thanks for that rec! BTW, I am not crazy about Ormonde Jayne’s frangipani fragrance, but it has a lot of fans here, so might be worth a try. Added the Le’a to my wish list at The Perfumed Court (handy thing, that). OJ Frangipani is not my thing. I’d like to be able to say that I like it but not as a plumeria scent, but I can’t — to me it smells just like The Body Shop’s Dewberry that all my friends wore in college (a nice memory, but not something I ever loved). I smell no plumeria at all in it. Kevin – you crack me up. I LOVE original Woolite!! I used to wash all my shirts in it after I went to college (and my mom couldn’t give me sour looks for being so extravagent)! What a smell. Hmmm, maybe they should do Mitsouko FdL laundry and household products! I’d buy those…sounds like its tester worthy at any rate. Ann: MFdL is hard to come across unless you live in NYC. I used Woolite too…I remember my hands getting numb and red as I washed sweaters in ICE COLD water and Woolite! Well, then I doubt I’ll be able to test it – what a relief to my mind. Anytime these days I can dodge a bullet of fragrance desire, that’s a good thing! …..Yes, the ice cold hands. I recall how insanely long it took to wash all the suds out if you used too much!!! I had this one dense wool sweater that was just awful for the rinse part. Too funny. I am for sure a lotus ignoramus, as I’ve never been close enough to a lotus to stick my face in it and inhale… this needs to be remedied. As to lotus perfume, every time I’ve tried to wear something with “lotus” in the notes, I get a very bright, almost harsh bubblegum scent. This is true only of lotus scents on me… and I am reasonably sure that in real life, lotuses do NOT smell of bubblegum! And like Joe, I think I’ll stick to my Sur le Nil, though the bright mango of the Pacifica does sound nice! Haidee: the faux lotus can be harsh…and no bubblegum in the real scent . HA! I have never smelled Lotus, but i HAVE smelled WOOLITE! HA! C: then you can delay your trip across town to Bergdorf’s. True, but Barney’s is still calling out for me to come and visit Tarocco and Afrique. Dang, that Bal d’Afrique… another one I really need to try. Barney’s has Tarocoo online already, so I would imagine they would have it in stock by you. Kevin, what do you mean by sweet? White floral sweet or fruity sweet? Depending, I might get a Mitsouko Lotus. I like white floral sweet. I’m a girly flower women. Yuk, huh? Alotofscents: then you may like this…I found it flower-sweet! I was in Paris recently and did the pilgrimage to the Guerlain flagship store on Champs Elysees. I couldn’t see MFdL there so I asked one of the ladies and she said it was a limited edition and there was none left. Not sure if it would have been my cup of tea but was hoping to pick it up as a gift – has anyone else seen it around? Also stopped in Hong Kong on my way back and couldbn’t see it anywhere, so either it was VERY limited or VERY popular! You can buy a sample of it at the Perfumed Court. Not as thrilling as a full bottle, but at least you can try it. I’m really looking forward to smelling this. Mitsouko doesn’t work for me until the dry down. I thought maybe this might be closer to my kinda thing. hurrah! I’m forced to stick with solid perfumes as a rule – I’ve been traveling for 9 months and I’ve got at least another year to go. No liquids is the best policy to make airport travel easy. I’ve been missing my beloved Le Jardin Sur Le Nil, maybe this will bring some comfort. Definitely on the solids. I was in DC recently and the TSA guy manhandled my little spray decant of Chinatown! I was almost arrested! And Santemon…Paris, Hong Kong — sigh. I get to go to DC again and Des Moines in a few weeks. Kari: good idea…I’ve been traveling with lots of samples which makes things “confusing”; I like to stick with one scent on a trip. I’ve been reading several reviews for the Mitsouko, and I am consistently baffled. I really wouldn’t have much interest in it, usually (I’ve never smelled lotus and I’m not so nuts about very floral or very fresh fragrances) but I just recently got a purse spray of the vintage Mitsouko. While I’m not exactly in love- it tends to wear me instead of the other way around- I can’t wrap my head around how these two fragrances can be even remotely related. I’m very new to perfume and, therefore, can’t really have an educated opinion, but this seems like a giggly school girl, while I would say the vintage Mitsouko is more of a smirk. Immensely confounding. I feel like most flankers have nothing to do with the original scent. I think they just do it to ride on the coattails of the popularity of the first fragrance, and therefore don’t have to try as hard. Seems to work–I feel like there has been more buzz around Mitsouko FDL than Guerlain’s other new fragrance, La Petite Robe Noir, and the latter has had more advertising. Oh, I’m not saying LPRN *should* be getting more attention! The licorice really does sound appalling. I’m just saying that i think the Mitsouko name will carry more weight than the advertising I’ve seen for LPRN. Be nice! I’m new here! Rachel: we all have different perceptions of perfume, and most other things!, so “education” doesn’t come into it. Mitsouko to ME is a deep, heartfelt laugh, faaaaar from a ‘smirk.’ If you were to smell Mitsouko and Mitsouko FdL side by side you’d notice a faint resemblance. I love and wear the original Mitsuoko, admittedly not a fan of ozone or aquatic. I still would like to try it for interest’s sake….. The only lotus I’ve worn is JM’s Lotus B & Water Lily. I forgot about that JM one and I own it! Kevin, it may be wayyy too aquatic for you if you tried it, but do you think there’s anything remotely “lotus-y” about It? I actually find it quite enjoyable for an aquatic floral. Musette: before writing the review I made a call to a “certain store” and was told also it was a simple re-packaging of the original scent. WE’RE in the vanguard, I guess! Don’t you just love WELL informed SA’s? Grrrrrrrrrrr. Do you know when the Guerlain one will be released in New Zealand? I must have that bottle! Nenalata: sorry, don’t know when or if it will get to N.Z. It seems to be limited distribution…for now anyway. Aw… I must get it somehow! The bottle is pretty, and I can add it to my collection of other Mitsouko-style bottles. I really wonder how classic Mitsouko smells like? ?It is unavailable in Turkey market and i need an idea to order it online.I know Mitsouko homem is one of your favorites how about classical women ? ?